It had been a long wait, and truth be told I had thought that I would never see watchmaker Patrik Sjögren and blade smith Johan Gustafsson’s Damascus steel watches in anything other than an online form. After a number of years of tracking them on social media in particular, I was finally able to see these most ‘metal’ of ‘in the metal’ watches at Baselworld 2016. What had drawn me to them was both how unusual they were as a dial material and how hypnotic the patterns were. 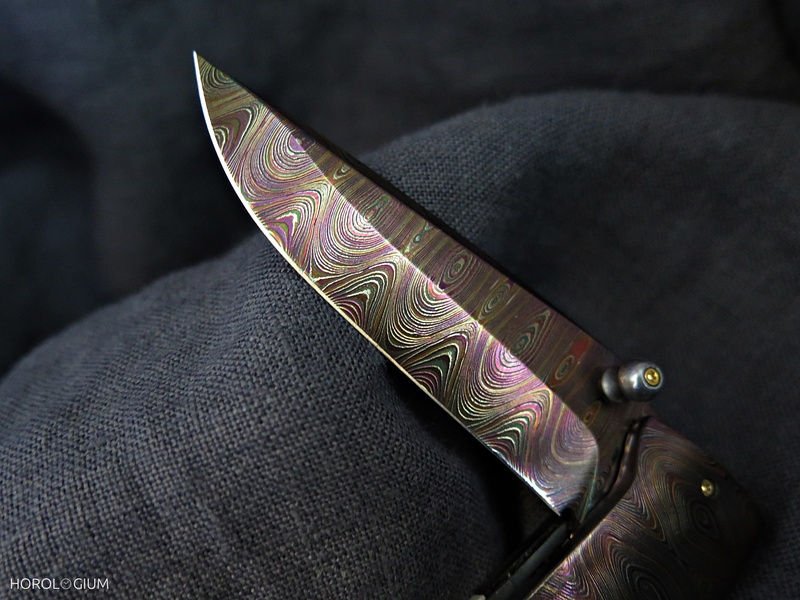 So what is Damascus steel? The original method of producing Damascus steel is long lost. The term itself can be broken down into ‘cast Damascus steel’ (aka ‘Wootz’) and fabricated (aka ‘pattern-welded’) Damascus steel, with both characterised by patterned steel that is the result of the mixture and manipulation of iron and steel. The general idea is that two or more steel alloys are forged/ cast together in layers through various methods to get particular (mostly wave) patterns. As the name hints at, Western Europeans were first introduced to it circa 3rd – 4th centuries from Damascus. Wootz was popular outside of Europe, linked more to the Middle East and through to India. Pattern-welded steel in the form of katana were developed in Japan in the late 1100s during the Kamakura period. Wootz is produced by melting pieces of iron and steel with charcoal in a reducing atmosphere. The metals absorb carbon from the charcoal and the resultant alloy is slowly cooled, resulting in a material with a visible crystalline structure that is then able to be forged into a blade for example. It is in the forging process that the wave pattern appears. The high carbon content is what is important to this; the proportion of it has to be exact, too little means you will get wrought iron and too much, cast iron. Pattern-welded steel is similar to Wootz but less labour intensive. Two or more pieces of iron and steel are layered and then forge-welded together produced pattern-welded steel, forcing the two metals into one. Stretching this new composite material and forge-welding it back onto itself is what gives the multiple layers that can be manipulated to produce the similar pattern. What is referred to as ‘Damascus steel’ nowadays, given the lost methods of yore, are those that are pattern-welded. The blade smith behind GoS is Johan Gustafsson, who has been doing this for over two decades. He takes his inspiration from Viking blades of the Middle Ages and is known for pattern-welded ‘mosaic’ Damascus steel, which is exactly what it sounds like – the ability to create repetitive patterns. Damascus steel is hard. Very hard. Which makes the use of it more difficult in terms of the traditional finishes used in watchmaking such as bevelling and polishing, for example. As well as the dial and case, some GoS watches have Damascus steel used in the movement, and the difficulties of using this sort of steel, including treatment such as the use of hot acid to make these vivid patterns visible, means that the the entire process of just finishing a single part up to the ‘finishing’ point can take up to a week. 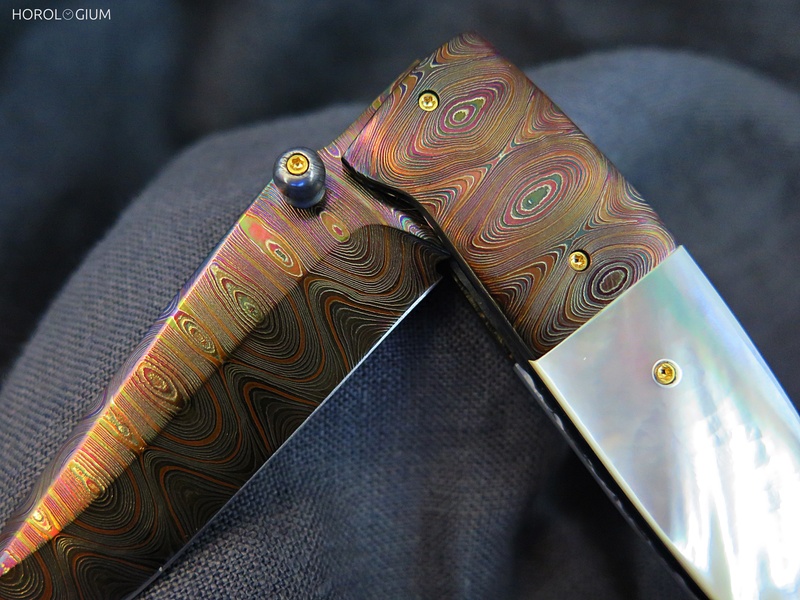 As per the movement, the Damascus steel cases are also dipped in acid, twice. Only the visible parts of the case are exposed to the acid to ensure that the case maintains its water resistance. The dial patterns on the Damascus case models have over 120 layers. A dial starts with 2.5kgs worth, using four different steels which are stacked into a 12-layer billet (in ‘steel language’, a billet is a semi-finished piece of steel product that has a round or square shape, with an area less than 155mm x 155mm. Because it is semi-finished it needs further processing). This is then forge-welded (as per the description earlier) ten to twelve times to get the requisite layers. At the end of this process, the surface is then worked on by him to achieve the desired design/ look. To give you some idea of how much work goes into the dial, this 2.5kg only generates five dials. Today I am sharing two models with you. The first is the Sarek, which had its premiere as a prototype at Baselworld 2016. In a 43mm stainless steel case, it has GoS’s largest Damascus dial to date and is also the first model to have the new crown inspired by Viking sword hilts. The Viking nod continues on the hands, which are inspired by Viking bracelets. The landscape of a valley in the Sarek National Park in Swedish Lapland is the source of both the name and the colour/ pattern choice for this model. 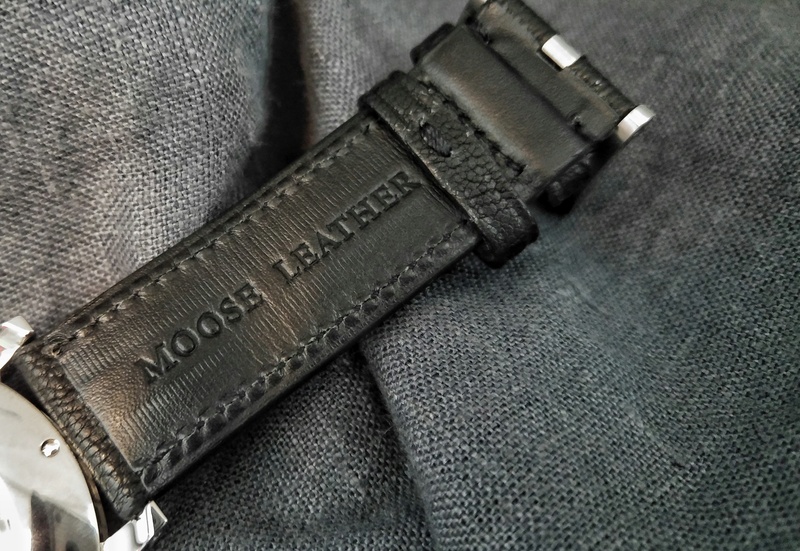 Home to some of Sweden’s highest peaks, glaciers and the largest Moose population in Europe, this last point has, rather delightfully, made its way to the Sarek strap, which is Moose leather. The dial is a 164 layered Damascus steel and because of the nature of the material, every Sarek’s dial will be slightly different, although obviously they share the same overall ‘feel’. As mentioned earlier, there is Viking inspiration in the form of the index ring (bracelets), hands (spear), and how the case is finished (again, Viking bracelets). Inside the Sarek is the popular and reliable Soprod A10 movement, but with a custom rotor in a GoS triskele design. The Sarek is limited to one hundred pieces and each will have ‘Unique piece 1/1’ engraved on it, as well as its serial number. They also come in their own special ‘Svepask’ boxes made of birch wood, and have a five year guarantee. The cost? USD $7,800 (plus 25% VAT). Some have already been delivered but you can find out more ordering details at this link. Today’s second piece is called Winter Nights, part of GOS’ seasonal pieces. There is a ‘Winter’ as well, which you can see on their website, and there have been, in 2013 and 2014, other Winter Nights variants. This one is, like the Sarek, 43mm, but it has a Damascus steel movement option and the case is bi-metal (stainless steel and Damascus steel). For this model, there are 192 layers to Gustafsson’s Damascus steel dial, whose design represents a wildflower. Again, every Winter Night will be, by nature of the Damascus steel process, be slightly different. Inside is the GoS02 calibre, which is based on the manual-wind Technotime TT718. Power reserve is five days. The bridges of the base calibre have a straight grained finish with polished beveled edges, whilst the main-plate has perlage and a dark gray surface treatment. All wheels as well as the GoS logo are gold-plated to match the pink gold. Winter Nights is available with movements with either this classic finishing as per my photos, or with a Damascus steel GoS02-movement with Damascus bridges, which are made from woodgrain-patterned steel with the requisite hand-finishing and polishing. You may also note the crown, which has nine indentations in it. This isn’t for grip, but a reference to a significant number in Norse mythology, but if it assists when wearing gloves whilst hiking in Sarek for example, then that’s a bonus. As mentioned, the Winter Nights is bi-metal. It is also available with hands and the index ring in white gold or in red gold, as well as the movement options. Unlike the Sarek it comes on a nubuck leather strap, although you can request Croc. Each watch is engraved with a production number and it also comes in a Svespask birchwood box. One of the great things about dealing with small brands and independents is that there is more scope for flexibility; GoS’s website states that Winter Nights is able to be customised, so if this watch takes your fancy, contact them at this link. GoS watches have rather beautiful dials, and especially so when viewed under a loupe – in my case, a Loupe System one. The colours are gorgeous and the effect a little hypnotic at close range. These watches are not just for those who are into blades or Damascus steel, they are also for those looking for something different and who can appreciate the amount of work and skill not just in the making of the steel but also in turning it into a watch dial (and case). Oh and if you’re wondering the answer is ‘yes’, you can get a watch and knife set. Click here for details. love these watches and how each watch is “individual” because the steel will be different from one watch/dial to the next.